Our largest local farmer’s market opened this past week and we ventured down there yesterday to prowl the produce. The selection is still a bit sparse, given that spring has only just begun, yet we were able to find some interesting things. The organic apples were gorgeous and crisp, as they should be considering that this is Washington state, and greens abounded. We found some locally gathered stinging nettles and I couldn’t resist the novelty of them. I’ve had nettle tea in the past but had never prepared, let alone eaten, a nettle. The other food that made me stop and consider it was rhubarb. I’ve always believed that I hated rhubarb because of a rather nasty piece of pie I once had, but I forced myself to gather up some of those gorgeous ruby-colored stalks and hand them to the vendor to purchase. I knew that I could create something with these fearsome stalks that would be tasty, though I wasn’t sure yet just what that would be. So there I was with organic Pink Lady apples, stinging nettles, rhubarb and Brussel’s Sprouts. What to do…what to do? Grate two apples and slice the rhubarb. Transfer to a non-reactive pot and add in the apple juice. Simmer until the apple and rhubarb dissolve. Add in the miso paste and chili garlic sauce. Nettles should not be handled by bare hand until they have been cooked when the sting is no longer a worry. Using gloves and kitchen shears, cut the leaves from the stalks. Add to a pot of simmering water and cook for 10 minutes. Drain. When the vegetables are about 5 minutes away from being ready, add the soba noodles to boiling water and cook. 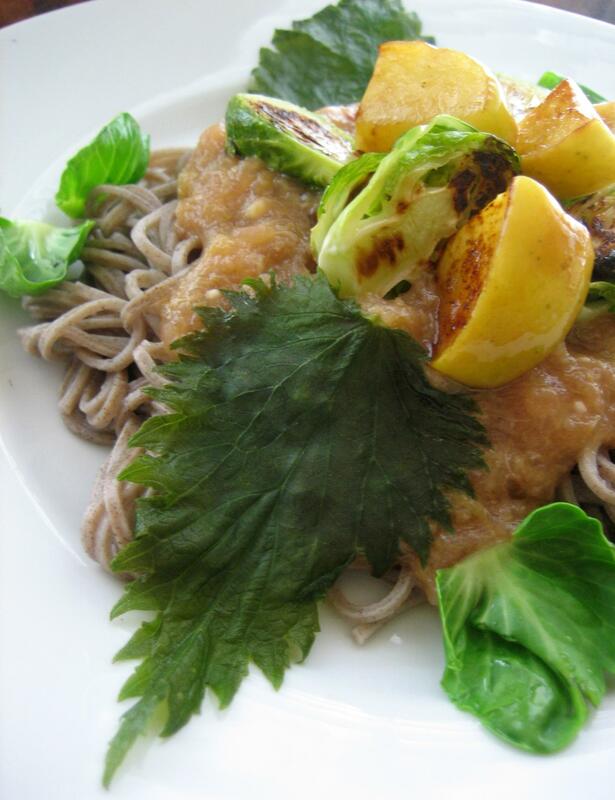 Serve the noodles with the sauce and top with the greens, sprouts and apples. *I can now say, with amazement, that stinging nettles are my favorite green. They are incredibly tasty and have a great hearty texture. It’s no wonder, these greens are 40% protein!